Living With a Mayan Family in Guatemala. It was almost midnight when I knocked on the door of a humble yellow house, hours after the tiny village of San Jose had tucked in. Below, lake Peten Itza glowed softly in the moonlight. As I settled into my new home, a sense of calm came over me, a drastic change from my adventurous bus ride from Antigua (See: A Glimpse of Antigua, Guatemala). We crashed into a pole at the start of the journey, shattering two windows (luckily no one was seriously injured), and after waiting forever for another bus to transfer to, the bus driver drove so slowly that cyclists overtook us. When I was finally deposited at the deserted bus stop of a Guatemalan town close to midnight, I wasn’t sure if the folks from Bio Itza, the Spanish school I was to enroll in, would still be waiting for me. My backpack gave me away, and Aderito and his father called out to me; their warmth quickly put me at ease. A glimpse of Peten Itza by night. My introduction to Alex and Elise Tesucun is something of a blur. I remember waking up on my first morning to peppy Spanish music pouring out of the room next door, feeling completely disoriented. I tiptoed out, and saw the family circled around the table in the kitchen, hand-rolling corn tortillas – a ritual I would become part of in the coming days! Th Tesucuns were descendants of the native Mayan Itzas – one of 22 indigenous Mayan communities in Guatemala. It was hard to tell that at the outset though. They didn’t speak the native Itza language, reserved their traditional costumes only for fiestas, and didn’t worship the ultra cool Mayan gods. Guatemala’s dictatorship era had taken a serious toll on the culture of the Itzas: For centuries, they had chosen to live by the lake of deeply forested Peten, preserving the tropical rainforests and relying on it for food, herbs and medicines. But as the only Mayan community in the region, they were forbidden from speaking Itza or wearing their traditional dress; anyone who dared to disobey was beheaded. As a result, only 34 people in the entire village (of 2800 Mayan Itza families) speak Itza today, and in my new home, only Alexito, the youngest of the 3 boys, spoke a few words of it. For fear of it disappearing entirely, Itza is now being taught in primary schools. Elise quickly let me in on the family history and gossip. How she and Alex were engaged at 14; how she was one of 10 children her mother had borne; how 2 of her brothers passed away young because the hospital was too far and too expensive in those days; the divorces in the family; how she and Alex had stuck it out for 20 years; how in this generation, their family had the least number of kids. Life on the other side of the globe didn’t seem all that different from India (Read: My Impressions of Guatemala). In the mornings, I walked the short distance to Bio Itza, where I was the only Spanish student that week. We had no textbooks and my twenty-year-old teacher Yenni, spoke not a word of English. For four hours every day, we discussed verbs and vocabulary, and had conversations about every aspect of life. We spent one lesson drinking Galle (the local beer) by the lake, chatting about boys and relationships in Guatemala! 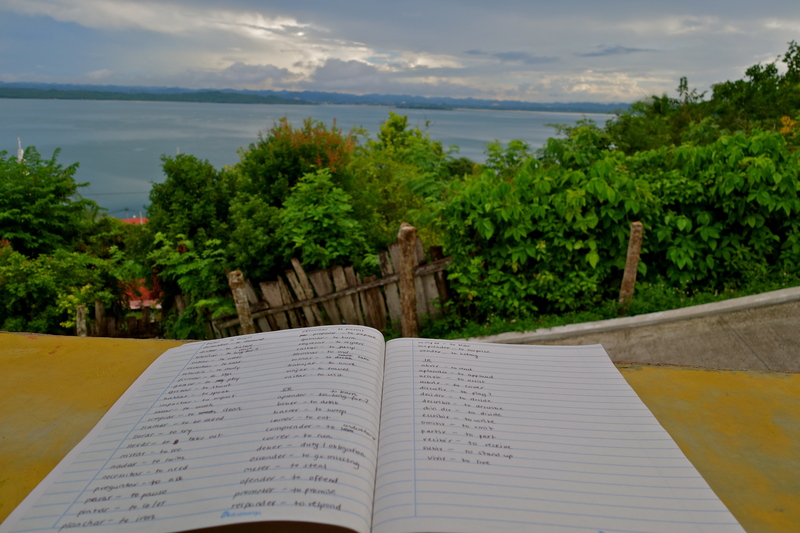 Studying Spanish with a view of the lake from the verandah. Back home, I saw a great sense of camaraderie in the family. Alex often helped Elise in the kitchen, and over weekends, the boys helped their mother in cleaning, washing and cooking. We always had company at meal times. There was Victor, a linguist who could speak five Mayan languages and was documenting Itza, otherwise only passed down orally. There were Carlina and her father, jolly and always willing to help me practice my Spanish. There was Elise’s mother, loving and kind. There were friends from the neighbourhood, relatives from near and far, and people who showed up unannounced – but no matter what, they were always fed heartily and conversed with animatedly. I often saw Elise having plain rice with leftovers and relentlessly scrubbing dishes in the back. She would refuse my help and once told me: people think our culture is dead, but THIS is our culture, we treat everyone as our own. Tortillas, black beans and eggs for lunch. Living in a remote little village is never without its challenges, and so it was with San Jose. My room at the back of the house became sweltering hot during the day and damp at night (there was no fan or window; I always left the door open for ventilation with a thin curtain drawn), and opened into a yard where a bonfire was lit each morning to slow cook meat, the whiff of which often drifted in. And yet it felt wrong to feel discomforted, because in order to accommodate me in a private room, the rest of the family (and their many visitors) slept in a single room at night. A single bathroom was shared among all of us, and there was never enough water for everyone to shower off the humidity, wash hands, or even use the flush – the lake brimming with water below, often put life into perspective. Still, the moment I lay on the hammock, feeling the breeze in my hair, all my troubles went away; the family, me included, took our turns to sway. A hammock can fix everything. My room at the homestay. When my mind switched off from all the Spanish spoken at home, I hiked around the village, built around steep slopes, spotting magnificent birds in the wooded interiors, stopping to watch a game of football at the public court, peeping into the village cemetery with graves overlooking the lake, hearing the church bells announce prayers, and making small talk with locals lingering outside their home. Sometimes shy young girls and boys would approach me in giggles, asking to take a selfie with me, and wanting to add me on Facebook! Other times, old women with beautifully wrinkled faces and flowery dresses would stop me to ask about my pais (country) and joke about things that were mostly lost in translation. The village of San Jose. All roads in the village though, led down to the spectacular lake, on the shores of which I spent hours writing, reading, thinking, dreaming and just being. On some days, I was an Itza; a permanent fixture by the lake, Peten my home, my family waiting for me. On others, I was one of the birds flying above the lake; now here, gone tomorrow. Birds flying above Peten Itza. Join me on Facebook, Twitter and Instagram for more travel stories from around the world. Any contributions to my Travel Fund will be much appreciated! Have you ever lived with a family in a country far from yours? Love your post and your wonderful spirit how you conquer the world on your trips. If I would be younger I would do the same thing. Maybe I’m too young to say it’s never too late? Oh no not all, never too late to say that. Great post! Makes me want to pack my bags and head off to some remote destination! Enjoy your travels. Do it! What’s stopping you? Thanks, it was some experience indeed! So interesting to learn about the Mayan culture. These strangers we meet during our travels somehow always restore our faith in humanity. Love it! I don’t know if you read my earlier comment, but this is exactly the kind of post I was looking forward to reading. A portrait of the family you lived in. Excellent work, Shivya! Shine on! I was thinking of your comment when I was about to post this! This is amazing. In westernized countries, we are so privileged that we no longer know the meaning of ‘need’. All we do is want. Its really important to learn from other cultures, especially those that have been affected so harshly. To learn from their simplicity. I agree, Ash. Even in India where there is much to ‘need’, we take many simple freedoms for granted sometimes. Found this one through responsibletravel.com. Shall be doing a post on experiential travel planning soon though! I’m glad you loved it 🙂 Lots more coming soon! First,amazing how to conquer ur love for travelling.Second, amazing how you translate your emotions so beautifully into words,honest and transparent..
Love to hear of your adventures!!! http://www.atelier-africa.com/wp-content/uploads/2014/08/grande-genieten-Namibi%C3%AB.pdf and the Lonely Planet Best in Travel 2015. Thank you for portraying Guatemala as a beautiful unique place and show people we are much more than just a violent country. Loved the article it made me miss home more than ever. I hope you return to Guatemala soon. Cheers ! hope to read more of your adventures too. The plan right now is to visit Tikal for a day and spend the other three days in Antigua and lake atitlan! Hope you continue to enjoy your stay there! Nicely written. It feels good to travel and stay the local way! Previous PostGet Busy Living or Get Busy Dying. Next PostHonduras: We Travel to Realize Everyone is Wrong About Other Countries.